11 Responses to Lordi Machine launch! Is that the same Lordi that rocked Eurovision in ’06? Don’t like Lordi, but gonna play this. I guessed before you!!! Jeff just wanted me to keep it down, where’s my money? 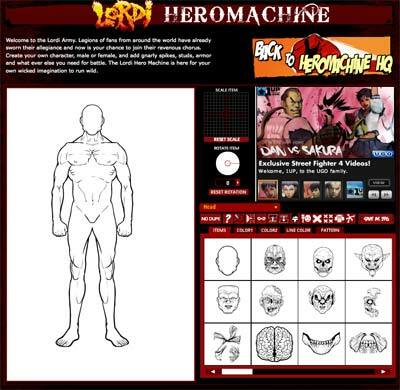 NOW TIME FOR HEROMACHINE 3!!! dude, why is there no hair item? i’m trying to make a chick and she comes out bald. @thejay. I to was in the middle of making a female character and I discovered the hair problem. I had to use a femine hairstyle from HM2.5.